One way to increase satisfaction and create a meaningful workplace is to create a dynamic, engaging culture and then hire talent that fits this culture (i.e., culture fit). 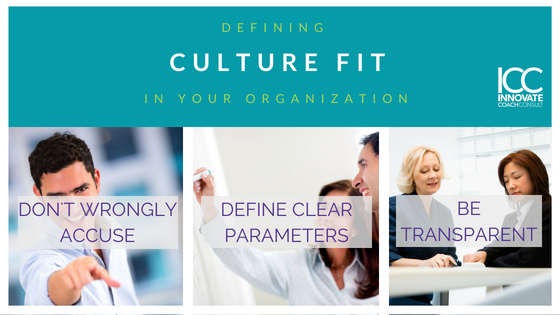 Culture fit can be an elusive concept as it is hard to define, but we certainly know when it is missing. At its core, culture fit means that employee’s beliefs, behaviors, values and assumptions are in alignment with the company’s core values, beliefs and behaviors. The simplest example of a misalignment and bad culture fit might be when someone has a personal belief in renewable energy and creating sustainable resources for our environment and he or she works for an oil and gas company. Don’t Make Unjustified Accusations. Before you make assumptions that someone is “not a good culture fit,” take the time to identify and clearly articulate what the organizational culture is and why someone may or may not be a great culture fit. For example, if collaboration is a key organizational value, people who have a genuine, authentic belief in the value of collaborative work will be a stronger culture fit than those who are more comfortable working as individual contributors. Do not confuse personality similarities or likability with culture fit. There has been a lot of talk recently about how looking for a culture fit can lead to discrimination against job applicants and a lack of diversity. Certain policies or emphasis on employee benefits can be discriminatory. For instance, employee benefits that emphasize drinking (i.e., beer keg in the office), doesn’t encourage the hiring and retention of working mid-career professionals who don’t participate in this type of activity or don’t value this as a “benefit.” With clearly defined organizational values and attributes, an organizational culture can and should be reflected in a richly diverse workforce. Be honest with job applicants. Rather than simply saying, “you were not a good culture fit” when the interviewing process has concluded, be transparent with the candidate and provide substantial reasoning as to why they weren’t the desired applicant for the job. For a lot of job seekers, “culture fit” is becoming the greatest hurdle when it comes to progressing in the job search. What is your experience with culture and your opinion on its importance? We’d love to continue the conversation.